It’s old news that Apple is lagging when it comes to making the Mac platform friendly with tapeless camcorders. 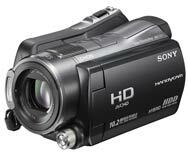 Currently, only a few tapeless camcorders out there are truly Mac-compatible, and Sony’s high definition HDR-SR11 Handycam happens to be one of them. Easy to use, craftily designed, and packed with features, the HDR-SR11 is a strong contender in the tapeless HD camcorder market-especially because it currently doesn’t have much competition. This camcorder shoots and stores high-definition video and still images on a 60GB hard drive or Memory Stick Duo or Pro Duo card. Most importantly, you can import your video seamlessly into iMovie ‘08 or Final Cut Pro. On top of that, the camcorder’s video looks stunning, on par with that of Canon’s Vixia HV30 ( ), our top product in the Mini DV camcorder category. There’s still work to be done, but we can only hope more manufacturers work with Apple the way Sony did to get their camcorders working properly with the Mac. Though a little bulky, the HDR-SR11 rests comfortably in your palm. The weight of the camcorder tends to lean toward the left, so it’s best to hold it with two hands (left hand under the LCD, right hand on the body) to ensure stability. The zoom tab is within easy reach of your index finger. A menu wheel, which you control with your thumb, toggles between Memory Stick recording and HDD recording. I especially liked the design of the plastic doors all around the camcorder used to protect connection ports from dust: They easily snap open and are much sturdier than the removable rubber covers found on most camcorders. The HDR-SR11 features a very intuitive touch-screen control panel located on its LCD. Most camcorders we’ve tested use a joystick, which can be quick and snappy, but ever since the iPhone’s release, touch-screen technology has been getting sexier and preferable. The HDR-SR11’s touch screen buttons are easy to understand, so you shouldn’t need to consult the user manual to figure out how to use this camcorder. When it’s time to import your video and photos, the HDR-SR11 works exactly as it should: You simply connect the device to your Mac via USB, and iMovie ‘08 and Final Cut Pro will recognize the camcorder and allow you to choose the clips you wish to import. After that, all you have to do is wait for the files to transfer over and you can start editing. In our test footage, the HDR-SR11’s video at both low-light and standard-light settings looked impressive. Colors looked pleasing and accurate (though a little heavy on the blues) compared to our control objects. Upon close inspection, some motion artifacts were slightly visible, but they were negligible; for the most part, motion looked smooth. Our panel of experts gave the HDR-SR11’s video quality a Very Good rating. Still images were less impressive: Colors looked too dark, even when we used the flash. We photographed a line chart to test the HDR-SR11’s resolution, and overall the image looked slightly fuzzy. Our jury gave the camcorder’s still-image quality a Good rating. Sound quality was nothing spectacular, but built-in camcorder microphones have never been very good. Fortunately the HDR-SR11 features a microphone jack and accessory shoe so that you can add an external microphone. The HDR-SR11’s battery life was impressive, earning a Very Good rating: On a full charge, it lasted two hours recording until the camcorder shut off. Given the limited options Mac users currently have, the HDR-SR11 is an easy choice for those wishing to jump on the tapeless bandwagon. With this device, Sony has all the bases covered: the camcorder is Mac-friendly, sports impressive video quality, and is elegantly designed.